Persimmons are winter fruits that remain on the trees even after all the leaves have fallen from the tree. There are two main groups of persimmons: Asian persimmons, which are thought to originate from China, and American persimmons, which are grown in the southeastern United States and were widely used by the American Indians. 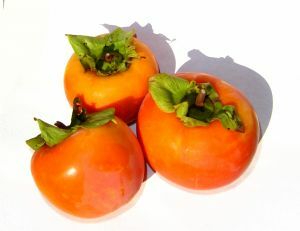 Some varieties of persimmons are very sweet when ripe and bitter and inedible when unripe. Thus, it is important to know how to tell the difference and how to select a persimmon. Ask the grocer which variety of persimmon is on display. They will generally be one of the two Asian varieties widely available in supermarkets. These are larger than the American varieties, and somewhat resemble tomatoes in size and shape. The hachiya variety is heart-shaped and must be consumed when fully ripe, as it is bitter and inedible when it is not. The fuyu variety can be eaten either ripe or unripe without much variance in flavor. Examine the color of the persimmon. Although color is not a good indication of ripeness one the persimmon has turned orange, avoid persimmons that are yellow or green in color. Gently squeeze the persimmon. Persimmons are fairly firm, but can be very soft if they are too ripe. Make sure the persimmon you select is not too soft.